The shrine of Our Lady of Bonaria (Good Air) dates back to the latter years of the fourteenth century, at Cagliari, on the island of Sardinai. According to tradition, on March 25, 1370, a ship ran into a terrific storm at a spot some miles off the coast of Sardinia while enroute from Spain to Italy. Soon the ship seemed in imminent danger of sinking, and the sailors in a last desperate effort to save her, began to get rid of the cargo. When they heaved a certain large packing case into the sea, the waves immediately died down and the sea became calm. The sailors knew the ship had been miraculously saved and attempted to regain the last crate, followed it for some time. Unable to retrieve it, the sailors returned to their original course. The case floated away, and pushed by the tides, eventually landed on the shore of Sardinai at the foot of a hill called Bonaria. The Mercy Fathers came and raised the heavy crate without any difficulty, and took it to their church, where it was opened in the presence of a large group of people. To the surprise of all, they found it contained a beautiful statue of the Virgin and Child. In her right hand the Virgin held a candle which was still lit! So when the statue floated in from the sea, and the Fathers placed it in their church, remembering what Father Carlo had said, they named it “Our Lady of Good Air,” or “Our Lady of Bonaria.” Due to the miracle, devotion to the Virgin spread quickly, especially among sailors who took the Blessed Virgin for their protector and carried her devotion far and wide. The statue is in colored wood, probably of Spanish workmanship. Pope Pius X in 1908, declared Our Lady of Bonaria the patron Saint of Sardinia. Most recently, on September 7th, 2008, Our Lady of Bonaria was visited by Pope Benedict XVI in honor of the first centenary of her announcement as the Patron Saint of Sardinia. 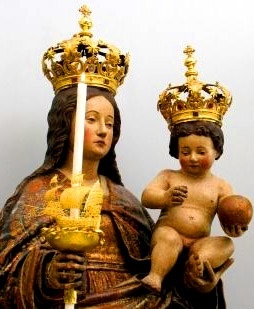 He gave Our Lady of Bonaria a Golden Rose.